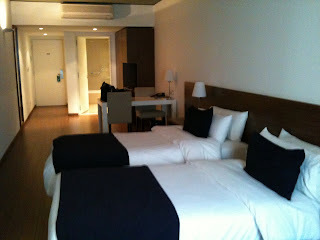 Where to stay: I really liked my room at the Dazzler Hotel on Maipu 850, right in the center of town. The room was spacious and clean with laminated wood floor and breakfast was included. The hotel is a short walk to Calle Florida and Galerias Pacifico. My only complaint about the room was the noise from the street below as Maipu is a bus route. So ask for a room away from the street. Parks: Buenos Aires has many beautiful parks, perfect for weary feet. Do go to a park where there are a lot of people so you're safe and be aware of what's going on around you. The plazoleta below is on Calle Arroyo and Avenida de 9 de Julio. ﻿I also liked the Plaza de las Naciones where you have a great view of the Florialis Generica from under bright yellow outdoor umbrellas.